Praman Group has established itself as a trusted and most preferred real estate developer in Mumbai through the strong work foundation of ethics and values laid down by Late Shri (Arch) Mahendrakumar N. Purohit. Praman group is an established brand owned and built exclusively by the Purohit Family and we at Praman continue the legacy built by Mr. M. N. Purohit on strong ethics, trust and transparency to create infinite value for all our clients. Our group in its zeal to set the bar high in the real estate industry created a 45 storey tower at Nana Chowk, Mumbai. In fact, Mr. Purohit had envisaged such mammoth structure well ahead of its time with state of the art amenities and facilities. The group has further evolved with a multitude of landmarks like Praman Solitaire , Praman Heights, Praman Residency, Praman Heritage and Praman Splendour are amongst many of its prestigious projects. Architecture should speak of its time and place, but prevail for ‘TIMELESSNESS’ Praman creates such timeless masterpieces in Mumbai. 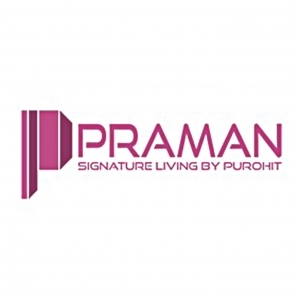 Praman, our corporate brand stands for actions that speak. It is about creating value for our clients through ‘Signature Living’.